"As an engineering student, I thought it would be impossible to study abroad. I am glad I didn't let that stop me!" relates Spencer Kingsburg, a chemical engineering major who spent spring semester 2012 studying in Auckland, NZ. 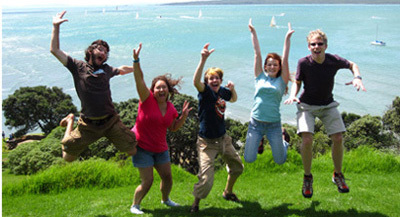 He's at the far right in the photo above, taken near Auckland. Who says engineering students can't study abroad? Engineering course requirements are too technical and sequential to leave room for studying abroad. There are very few study abroad programs available for engineering students. Though study abroad programs in the past were focused primarily on languages and area studies, courses in engineering, mathematics and sciences are increasingly available. Study abroad programs open to Hajim School students are now available in 19 countries. For example, Sarah Ko, BME '12, studied at Cape Town, South Africa, and is shown at left with her homestay family in Gugulethu Township. We've lined up equivalent, pre-approved classes in each of these countries so you can satisfy degree requirements without missing a beat. See these lists of overseas equivalent classes by country and by major. See also an Excel spreadsheet of courses previously taken overseas by Hajim School students. And the Hajim School now offers scholarships of up to $500 to help defray the costs of studying abroad. Click here to learn more. The growing availability of programs has increased the chances that engineering and computer science students can find study abroad opportunities offering courses that can be applied toward Rochester's degree requirements. To be sure, early planning is important. For example, a proposal to study abroad must be filed by September 15 for spring semester programs, and by April 15 for fall semester or full-year programs. The benefits of study abroad are well worth the early planning. When they graduate, engineering graduates often work for companies engaged in projects overseas. Study abroad experience not only enhances your chances of being hired, but of succeeding in your career. You can see a different part of the world, learn a new culture, and even become fluent in another language. Students who study overseas develop problem-solving, time management and communications skills. They become more independent and self-confident. They see the world from a completely new perspective. In an increasingly global world, understanding other cultures is essential. Few experiences during college will have as big an impact as immersion in another culture. Still not convinced? See our testimonials from Hajim School students who have studied abroad, and say they wouldn't have missed out on the opportunity for anything! Interested in study abroad? Contact Rohan Palma, Hajim School's study abroad advisor!